A good suit is not worn in isolation. 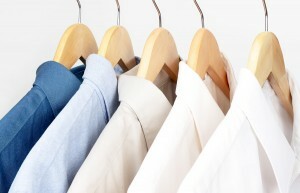 A good shirt, as well as shoes, belts and other accessories, are essential. Getting the right shirt underneath the suit tends to be something that is overlooked. These are noticeable. A tight collar quickly becomes irritating, a loose one looks unstylish. A collar can be adjusted slightly by moving the top button. Sometimes more dramatic alterations are necessary. Sleeves that are too long will protrude from the suit, and just ruin the whole effect. A longer sleeve can easily be shortened by the tailor, but lengthening a sleeve is not an easy option. Excess fabric, especially around the waist. This is a common alteration; the extra fabric is removed from the back of the shirt. Most men find that a shirt can be adapted to their build if it already fits in the essential areas. If the shirt fits across the width of the shoulders, which will not vary over time, the rest of the shirt can often be made to fit with only minor alterations. Occasionally, for some men’s builds, it is better to have the shirt made to measure. A striped shirt with a solid colour tie that matches the stripes. Slight differences and contrasts are acceptable. A finely stripped shirt with a broadly stripped tie. Try vertical stripes on the shirt, and broad diagonal stripes on the tie. Fine vertical stripes on a shirt, and fine dot or patterns on the tie. A vivid tie works well with a plain coloured shirt, white, or pale blue or pink. Ties are almost always darker than the shirt. A white tie is about the only exception, and these are uncommon. Try a light colour shirt with a tie of the same colour, only darker. E.g. : a pink shirt with a near purple tie. Use a colour wheel to choose contrasting colours for ties and shirts, with the tie being more prominent. Ultimately, the only thing that matters is that the combination works.